science fiction – Brendan Mancilla, Author. 1 San Diego, CA. ANTONYMS Oakland, Dallas, Tallahassee, Oakland. 2 To currently live in San Diego, CA. ANTONYMS currently living anywhere BUT San Diego, CA. When I think of the annual popular arts phenomenon that sweeps into the heart of Downtown San Diego, CA every year in late July I often experience an absolute bevy of emotions. That’s right, you heard me—a bevy. Going to Comic Con (for us ritualists who defy the odds and manage get in every freaking year) is a breathtaking, nerve-wracking, oft infuriating event that, despite the abuse it heaps upon us, leaves us wanting for more. After discussing it with a friend, we concluded that being a regular Comic Con attendee is like being a bad relationship of hopeless, and utter, dependence. Conversations about the lines (and the infamous Hall H ‘eyeball + pencil = tragedy’ event that was 2011) and subpar programming are rife and oppressive, but I’ll try to be level-headed in my reflection. Which, incidentally, is remarkably positive this year. Looking back, I went into this year very excited but also reserved; the sheer hassle of the event had stripped it of its appeal in recent years. I should also note that going into Comic Con 2013 I was one very sick boy and, incidentally, that forced me to really conserve strength and to leave when I started to feel exhausted and not three or four hours after the fatigue set in. That prevented burn-out in the first two days which, in the long run, helped me enjoy the event that much more. So let’s talk Con! Preview night was straightforward but, oh Dear Sweet God, was traffic a nightmare. Ultimately, I only spent about an hour and a half at Preview Night because the 8 and the 5 freeways were such awful messes. Still, it was nice to think that I was cruising the floor on the emptiest possible night but it felt like there were WAY more people at Preview Night 2013 than in previous years. I honestly think they’re selling more 4 Day + Preview night badges now than they ever have in the past because that’s what it looked like on the ground. But, as is the case with most things, I can’t know for sure. …I totally overslept. I mean, I only overslept by like a half hour but that meant leaving at 7:30 which put me at the convention center by 9:00 and at that point the line for the panel that I wanted to get into with a passion—THE LEGEND OF KORRA—was crazy long. I gave up hope of getting in and walked the line, just to see how long it was when a friend from work flagged me down and singlehandedly salvaged my day. KORRA is Nickelodeon’s sequel to it’s animated smash hit AVATAR: THE LAST AIRBENDER, but KORRA wrapped up season one before last year’s Comic Con—which meant that I, as a fan, had been deprived of Korra for more than a year! During the cast and crew Q&A panel the show-runners Bryan Konietzko and Michael Dante DiMartino showed us an awesome trailer for Book Two: Spirits. …and then they aired the whole premier. At which point I promptly pooped my pants. So the actual panel was relatively brief, having ceded nearly all their time to the premier, which was indescribably awesome. Skipping past the BONES panel (which didn’t interest me at all) we came to the next big event Marvel’s AGENTS OF SHIELD. Now, I’ve been broadly following the development of this show and, as a big fan of Marvel’s THE AVENGERS I was excited to see Joss Whedon promote the new television show, since his TV chops are well-establish by now after BUFFY THE VAMPIRE SLAYER, ANGEL, FIREFLY, and DOLLHOUSE. Cue the explosive applause, which sounded much more like a bomb going off, and then they showed the whole 40 minute first episode of AGENTS OF SHIELD. I thought it was brilliant—I recommend that you check it out when it hits Sept 24 on ABC. Of course, we went bananas for it and subsequently showered our adoration upon Whedon and the cast but that, for me at least, wrapped up Friday. Oh, boy. By Saturday I was feeling great and I chose to celebrate my renewed health in the most sane way possible: by leaving home at 4am with the foolish notion of getting into the Hall H line for the Marvel panel at the end of the day. I was at the Convention Center by 5:20am but the line, if you’re familiar with the area, wrapped behind the convention center and went as far as the marina. That, in the vernacular, meant that I was not getting in. Knowing that, I jumped ship to the Ballroom 20 line where I perched myself expectantly. The morning’s first panel was ONCE UPON A TIME IN WONDERLAND, a spin-off of the wildly popular ONCE UPON A TIME that debuted in 2011. Edward Kitsis and Adam Horowitz, the creators and runners of both shows, mentioned that what they eventually showed to us of WONDERLAND was a rough cut but—and I preface this with an acknowledgment of slackened expectations—it wasn’t really all that good. None of the characters were particularly well-acted and the CG seemed over the top and this is tough for me to say, since I’m a fan of the original ONCE UPON A TIME. Afterwards was the panel for the original ONCE UPON A TIME, a tactic intended to market the new show to us veteran fans of the first one. ONCE UPON A TIME had an incredibly strong debut in its first season but has really floundered in season 2, eventually straggling along for a stronger ending. With season 3 less than two months away, they had an uphill battle to prove to us that the excursion to Wonderland to save Henry will be worth our time. Kitsis and Horowtiz made mention that filming started this week, and that when the show debuts it will air 10 episodes without interruption in the fall with the remaining episodes airing uninterrupted in the spring. LOST, a show that Kitsis and Horowitz both worked on and that continues to exert massive influence over their newest creations, experimented with a similar concept by airing seasons 4, 5, and 6 uninterrupted in their respective Spring time-slots. Afterwards, we transitioned to the FUTURAMA panel. Futurama was cancelled by Comedy Central—something that I’m incredibly sore about. THE SIMPSONS is 25 seasons old, not super funny, and yet still on the air. Futurama is ending its 9th and final season, still funny and relevant, but getting canned. Still, the show’s runners David X. Cohen and Matt Groening poked good fun and made it a panel to remember with drawing contests and airing part of the series finale: Fry is falling to his death, and has a time-reverse button that takes him exactly 10 seconds into the past—right after he made the fateful jump. Brilliant, poignant, and hilarious; exactly how FUTURAMA should end. Then there was THE SIMPSONS panel immediately after; none of the voice actors showed because, let’s face it, the show is 25 years old and they don’t have to try anymore. Groening was up there with Al Jean and confirmed a Simpsons/Family Guy crossover among other things. Skipping ahead to the FAMILY GUY panel, which is always good fun—Seth MacFarlane was off filming his new movie but most of the cast (sans Mila Kunis) was there. What’s always hilarious about this panel is that Alex Borstein and Seth Green, who are fully aware each year that there’s a sign-language translator in the Accessibility area of the crowd, persisted to spew out the most disgusting terms in an effort to fluster the translators. It’s hilarious but not something I can really repeat here, but, you know, YouTube it. Succeeding the FAMILY GUY panel was the AMERICAN DAD panel which was less of an affair than its big brother panel given what I assume is the state of tumult the show is in. AMERICAN DAD was quietly cancelled by FOX and will finish the already completed tenth season on FOX but, and this struck me as bizarre, it has been picked up by TBS. Movements of this kind usually indicate that a show is in its death throes, and I hope this isn’t the case because I LOVE American Dad and find it superior to FAMILY GUY in every way, but I’m worried for the show’s future. THE CLEVELAND SHOW was also quietly cancelled but its lukewarm performance and reception has kept it dead. The end of the FAMILY GUY panel also meant a big break in my day. From there on out I was free to wander the floor of the convention hall, and below are an assortment of photos. The floor was packed; simply pulsing with humanity. They reduced the number of independent artists this year, and decreased the amount of novelty booths. The wooden mustache booth was gone! 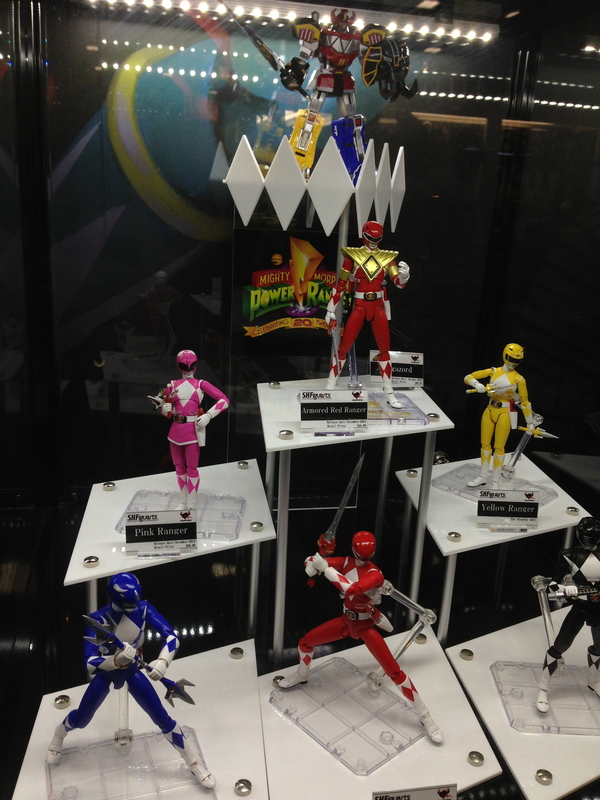 Also present were neat products and models. 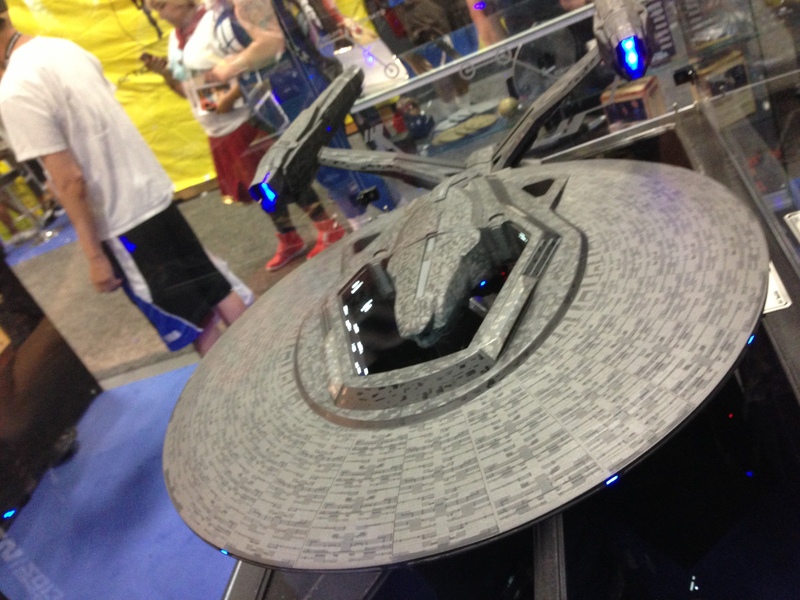 A large model of the USS VENGEANCE from STAR TREK INTO DARKNESS. The POWER RANGERS franchise is celebrating 20 years of childhood amazingness. 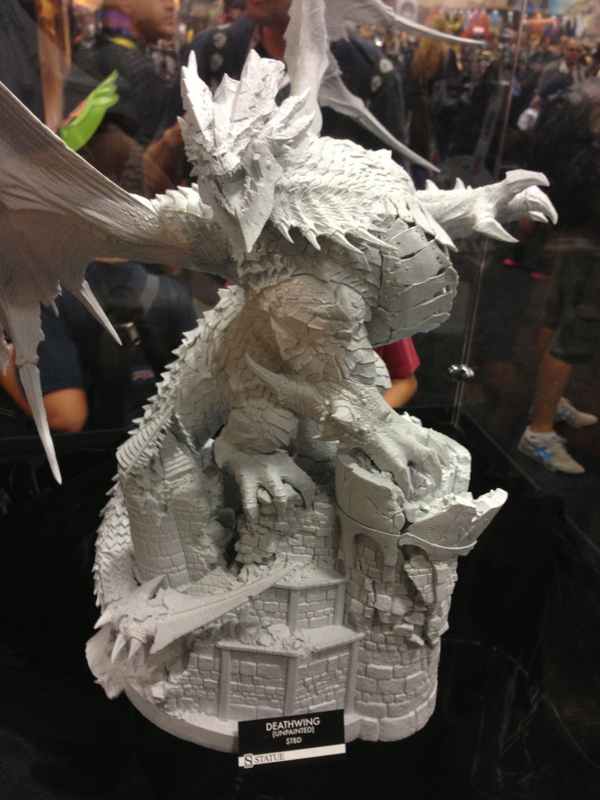 A model of DEATHWING from WORLD OF WARCRAFT. At 7:30, as something of a Comic Con tradition, I closed out my Con weekend by attending Kevin Smith‘s panel in Hall H. Smith is a strikingly genuine filmmaker who has devoted a better part of the last few years to advocating and supporting new and upcoming filmmakers. Always uproarious and often pensive, Kevin does a great job of balancing humor with real-world experiences. Beyond that, I can’t remember much because I was…so…very…tired… Nevertheless, he’s a brilliant guy and the crowd for his panel seemed noticeably healthier this year than in years passed. Afterwards, I made the victorious journey home. 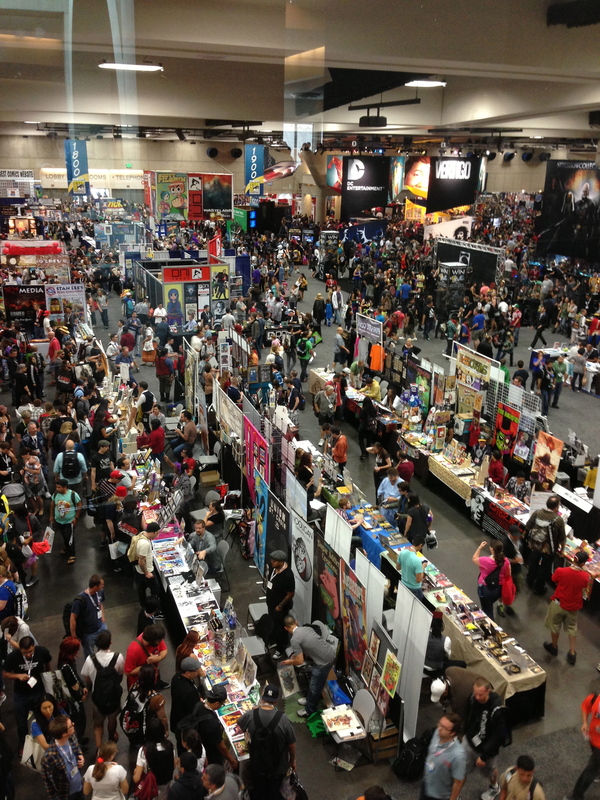 Comic Con 2013 was an success! Great shows, great panels, great sneak peeks at the upcoming television season! This event really shines when it honors the nerds, the geeks, and the hopeless many who congregate and preach their favorite popular arts phenomenons—and that is exactly what happened this year. I’m ready to start planning for the Con 2014—if I can get tickets, that is.